Engineered for effective vapor degreasing, ultrasonic cleaning, and immersion cleaning. 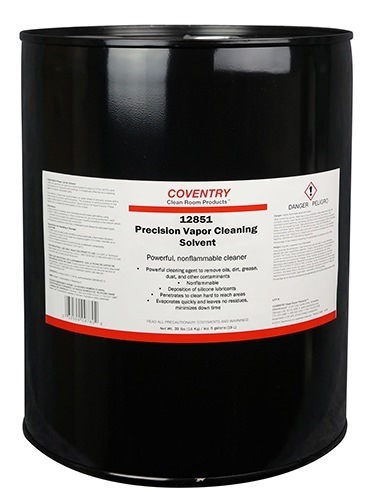 Coventry™ 12851 Precision Vapor Degreaser is a nonflammable solution engineered for demanding vapor degreasing applications and other precision cleaning applications. It quickly removes machining fluids and oils, particulates, debris, lubricants, and other contaminants from metal, ceramic surfaces, electronic components, medical devices, and much more. 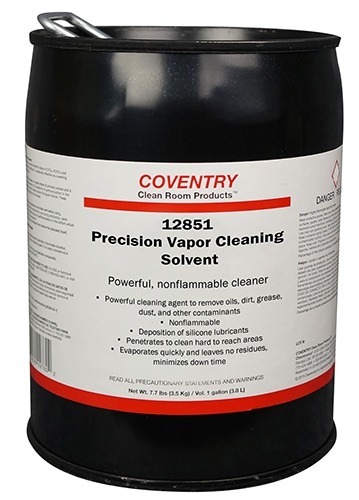 This near azeotrope was formulated to provide superior nonflammable cleaning in vapor cleaning applications, while still offering high soil loading potential and fast throughput. Utilizing novel replacement chemistry that does not contain any hazardous air pollutants or ozone-depleting compounds, this material provides the high cleaning strength required for the most difficult jobs.